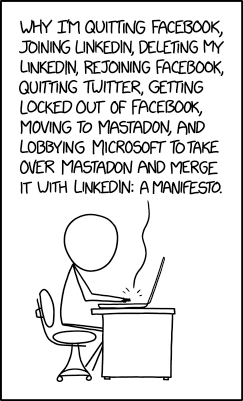 Fun fact, I did lobby Microsoft on a number of occasions to set-up their own open, federated social network (they don&apos;t have one and that would be a great move for them to screw Facebook, Twitter, and to lesser extent Google over; and anything that screws these over is good for us). and the "giving up completely, then going back to texting" is very relatable. @Wolf480pl ah yes, yes indeed. @rysiek @Wolf480pl I habitually join each time Yet Another Social Network appears. But I never leave the old ones I just stop paying attention. Now what the hell is my MySpace username and password? Does Ryze even exist any more?